Courtney is an accomplished real estate professional and joined NWR in 2015 as Regional Property Manager. Currently serving as Asset Manager, her focus is assuring an effective deployment of Northwood Ravin’s financial and human capital as they impact the financial performance of both individual apartment communities and the portfolio as a whole. Developing measurement tools that identify meaningful performance distinctions and using those to make recommendations for actions leading to improved performance are key objectives. Courtney's duties also include providing analysis and data in support of the company’s buying, selling, financing and development activities. In her role at Northwood Ravin, Courtney brings passion and focus to developing team members’ analytical, financial, management and leadership skills. 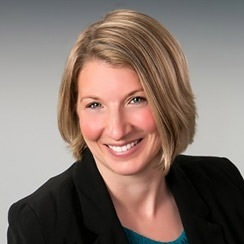 Courtney’s professional history includes both residential and commercial property management as well as development and operational experience in both new construction and historic tax credit projects. Prior to Courtney’s arrival at NWR, she worked throughout the mid-Atlantic and southeast with groups including Lincoln Property Company, Westdale Asset Management, Greystar Real Estate Partners and Capitol Broadcasting Company. Courtney is also a licensed North Carolina real estate broker.